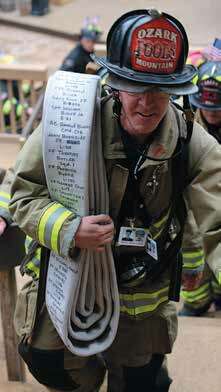 9/11 Memorial Stair Climb at Silver Dollar City | F.F.A.M. As our nation approaches the 15th anniversary of September 11th, when 343 American heroes lost their lives in the line of service in New York City, here’s your chance to show others that the phrase “Never Forget” is more than a slogan. Back up those words and join the hundreds of Southwest Missouri Firefighters and the National Fallen Firefighters Foundation (NFFF) on Sunday, September 11, 2016 for the Springfield Area 9/11 Memorial Stair Climb at Silver Dollar City. Participants will climb Echo Hollow Amphitheatre multiple times for a total of 110 stories, representing the number of floors in the Twin Towers of New York City. Registration is $35.00 and is open to the public at www.springfieldmemorialstairclimb.org. Everyone will receive a photo ID of one of the fallen heroes of September 11. Check-in starts at 7:30 a.m. at the entrance to Silver Dollar City and the climb starts at 8:30 a.m. Admission to Silver Dollar City (SDC) for firefighters and season pass holders climbing will be free of charge. All other climbers will need to purchase a ticket to SDC for a special reduced rate of only $30.50. These tickets must be purchased at the gates the day of the climb and will only be available for purchase at Silver Dollar City ticket booths. The climb’s proceeds will benefit the FDNY Counseling Services Unit and the programs provided by the NFFF to support the families of our nation’s fallen firefighters. For more information about the 9/11 Memorial Stair Climbs and the National Fallen Firefighters Foundation, go to www.firehero.org.